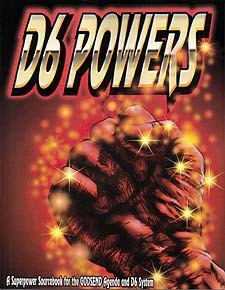 D6 Powers is a D6 compatible sourcebook that allows players to create super hero characters! Learn more about new and revised super powers, expanded special abilities, gadget creation, advantages and disadvantages for use in any D6 game. Discover a wealth of information on powers (new and updated), so many details that it took a whole book to contain them all. * Rules for superhero play with point built characters and a modular powers system that lets you build exactly the character that you want to play. * Revised and expanded powers for use with Godsend Agenda and generic "4 colour" super hero games. * Scalable rules for over 100 super powers. * Expanded Gadget creation rules. * Expanded super heroic combat maneuvers. * New advantages and disadvantages. * 26 new templates for use in any D6 game.